This is the first feature in a series of how to use desktop GIS for place-name research. With the growing pressure on all of us to be innovative and increase our digital footprint, it is worth considering if it is not worth learning something new to supplement traditional place-name research, namely GIS. GIS is an acronym for Geographical Information System and is a type of software which enables one to manage, retrieve, analyse and visualise spatial data. The typical fields of use hitherto have been within the scientific fields of geography and geology as well as public planning and management. However, GIS also has a great potential within the field of humanities where there is a need for storing, editing, analysing, sharing, and displaying geographic information. This can be anything from showing where certain dialectal words for the bank vole (Myodes glareolus) have been recorded to showing how and where General Custer survived his last minutes in the battle of Little Big Horn. Since place-name research – and often personal name research, too, for that matter – concern geographically locatable matter, a natural way of bringing onomastics one step further into the 21st century is to integrate GIS in place-name research. And there is no longer any reason for not utilising this fabulous tool for onomastic research. For long, the benefits of GIS in onomastic research were hampered by the lack of availability of reliable data and software at a price ordinary folk could afford. Until even a couple of years ago, GIS data was only available from National Mapping Agencies at nearing extortionate rates – at least for people employed in the Humanities sector. Similarly, GIS software has traditionally been extremely proprietary, often working with formats which could only be used with a specific type of software. All this is changing now, not at a quiet rate but in a regular landslide of free-of-charge data and even software has become freely available. And now is the time to get started! A number of National Mapping Agencies, such as the British, German and most of the Scandinavian ones, have released their place-name data for free download. In addition, place-name data download can be made from the American homepage www.geonames.org (under Free Gazetteer Data), which stores in excess of 5,000,000+ place-names in their system. Other National Mapping Agencies have not released their onomastic data freely, but instead released them under certain conditions. An example is the Swedish Lantmäteriet, where place-name data have been released for research purposes to people at Swedish research institutions. For years, GIS software was, as mentioned above, strictly proprietary and usually only available at a substantial yearly fee. This is still very much the case with GIS software giants such as ArcGIS and MapInfo. Not only are they quite expensive solutions, the data formats are not mutually interchangeable, although conversion plugins do exist. However, the Open Source idea has also entered the GIS scene and there are a dozen or so desktop programs available and almost as many online systems. The latter type are, however, characterised by having fewer features than the desktop ones. And since they are not part of this feature series, I shall relate no more to them (apart from using them to display example data). Many of the Open Source GIS systems were until quite recently very basic and not terribly user-friendly, to say the least. But this problem is not really there anymore, as the most mature of them are really on par with ArcGIS and MapInfo in features and user-friendliness. For this feature series I have chosen to use the Open Source software QGIS (www.qgis.org), as it seems to be the most mature of the freely available GIS programs on the market right now – and it’ll accept most universal data types you can throw at it and working with both ArcGIS and MapInfo format at the same time presents no problem for it. What can GIS be used for? The uses of GIS are really endless, but for onomastic research, the storing, visualisation and analyses of data is vital. GIS data is stored in single-table format but it is possible to assign databases, such as MS Access (MapInfo), Spatialite (QGIS) and PostgreSQL (ArcGIS, QGIS), to ease data management. In short, you can represent any geographical feature either as a dot, line or area (usually called a polygon in GIS terminology). In addition, you can perform advanced calculations on the basis of your data and e.g. calculate how many points exist within a given area or visualise where you have the greatest concentrations of certain place-name types. This means that you can make your own bespoke analyses and create nifty illustrations of them, such as the one of all certain and possible *Othenswī , ‘Wotan’s sanctuary’ names in Denmark I have just made for our online ‘Name of the month’ feature on my department’s homepage (http://navn.ku.dk/maanedens_navn/odense/). Figure 1. 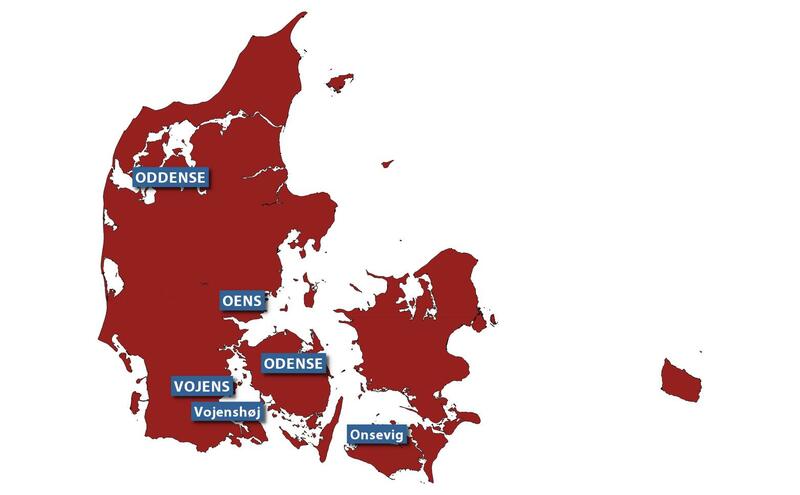 GIS map of Denmark showing the names of all possible place-names containing *Othenswī , ‘Wotan’s sanctuary’. Map generated using QGIS. Data may either be sourced from somewhere else, such as the Ordnance Survey or you can create a dataset which suits your research exactly. One example is a map I recently did to display Shetland parishes (http://www.onomastics.org/cartodb/shetland_1930.html), i.e. parishes from 1878 and civic parishes from 1930 which I am going to need for some work on Shetland place-names I need to do soon. This map is a so-called combination map showing the 1930 civic parishes as individual colours and the 1878 parishes as individual polygons. The Shetland parish map is the so far most precise parish map of these isles. It was generated by means of a Ordnance Survey polygon map of the British Isles and scanned first series Ordnance Survey 1” maps which were first georeferenced (placed correctly geographically) and the parish borders were then drawn using the parish borders drawn on the Ordnance Survey maps. In this way, a unique administrative map was created in a relatively simple and cost-effective way. Figure 2. 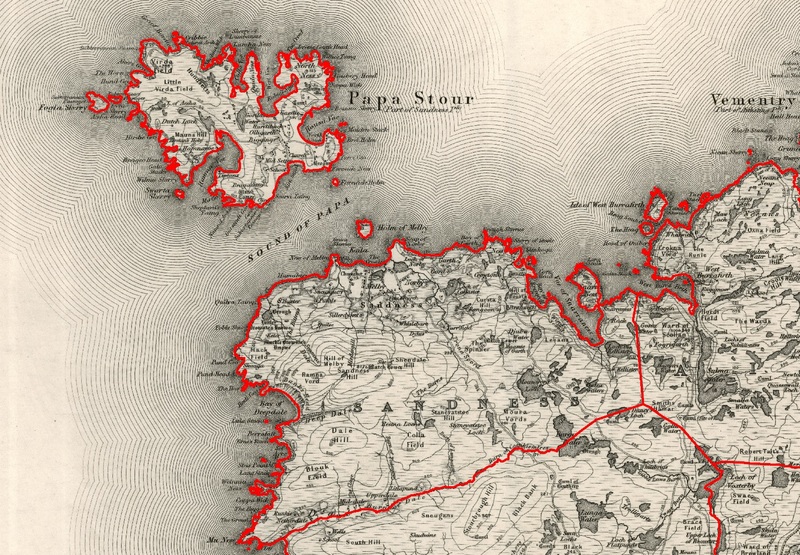 Georeferenced Ordnance Survey 1” map of Western Shetland overlayed by a polygon map showing the extent of Sandness parish in 1878. Georeferenced and drawn in MapInfo. These are just a few of the uses of GIS, but some of the more important ones in name research. The sky is really the limit as to what to do with GIS. Nonetheless, for onomastic research, the basic features will suffice in 90% or more in all cases. In the next feature I shall describe the basics of GIS, in particular with relation to QGIS. There will be an a basic introduction to how maps and projection systems, how to upload data layers and how to create your own basic point map.